At Bayside Kids Dental, we love seeing little smiling faces in our chairs, but we hate seeing your kids in pain or needing dental work because of disease or decay. That’s why we take a preventive approach to dentistry, so we can create healthy habits and catch small problems before they progress. We would much rather see your kiddos twice yearly for regular cleanings and exams than see them less frequently and have to treat dental problems—and although they may not be able to express the sentiment quite yet, we think they would agree! Schedule an exam and cleaning with us today! Bacteria, Plaque & Acid… Oh My! To keep tooth decay at bay, it’s important to teach our kids (and their parents!) about the little bugs that live in their mouths. Gross! We know—but not all these bugs are bad bugs. Many types of bacteria in the mouth are actually essential in helping us stay healthy by fighting bad breath, helping us break down and digest food, and preventing oral disease. However, SOME of these bugs ARE bad—bad bacteria are known as pathogens—and are the culprits of oral problems like tooth decay and gum disease. When your growing little mini-me eats or drinks something, bacteria in their mouth feed on the bits of food and sugars left behind. When they’re done feasting, the by-product leftover is acid. This is normal, but when there’s TOO MUCH left behind, it creates a feeding frenzy which results in an overly acidic environment in the mouth that is a breeding ground for the bad bugs that cause tooth decay, gum disease, and other infections. Plaque that is not removed by brushing and flossing quickly begins to turn into tartar—within only a few hours!—and when left for 24-48 hours it hardens into calculus (another word for tartar) that promotes bacteria growth and can only be removed by your Odenton dentist. Take a preventive approach to your child’s oral health by establishing and maintaining a healthy daily oral hygiene routine! We know it’s cliché for your dentist to ask, “Have you been flossing regularly?” But hey, most kids don’t understand clichés yet, and oral hygiene really is the most important factor when it comes to oral health! You know the basics by now—brush twice daily, floss every day—but there is more to it than that! How often you do these things is important, but equally important is HOW you do them. Oral hygiene looks a little bit different for kids of different ages, so we’re here to give you our professional advice on oral hygiene for growing smiles. One of the most important pieces of advice we have for you is to be gentle! Brushing too hard can easily damage their enamel and snapping floss up and down against the gums can easily damage the gum tissue. Light and precise pressure is all that’s needed to get the job done! Your little bundle of joy is welcomed into the world tiny and toothless, but oral hygiene is still important from day one! Gently wipe your baby’s gums with a warm, wet washcloth after feeding to prevent buildup of plaque, acid, and bacteria. A clean, healthy mouth encourages a healthy, happy baby! Your baby’s first tooth should emerge somewhere around 12 months or one year, and the rest will follow suit—teething can continue for as long as two years, but every baby is different. You should start brushing your babe’s teeth (or tooth) as soon as the first one makes its grand entrance. Use a soft-bristled, baby-sized tooth brush and only water for now and start flossing as soon as teeth start to touch. If you need some help getting through the teething process with your sanity intact, just ask us and we will be happy to provide you with solutions. Brush gently for two minutes at least twice per day. Hold the brush at a 45-degree angle so the bristles get along and under the gum line. Brush the tongue or use a tongue scraper each time you brush. Floss at least once daily. Curve the floss in a c-shape around each tooth and under the gum line. Release a new section of floss between each tooth. Rinse with water after eating, before brushing, and periodically throughout the day. You can start using a pea-sized amount of fluoride toothpaste around age three when they are able to spit the paste out effectively. 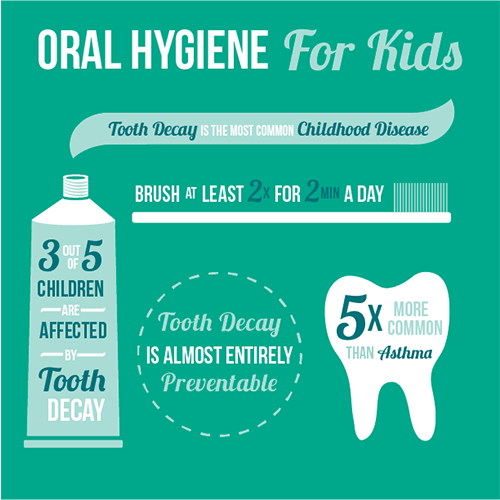 Continue brushing and flossing regularly for them. If they’re not exactly thrilled with the regular oral hygiene routine, there are things you can do to make brushing and flossing more fun. Try singing or humming a tune for two minutes, using a gold star or sticker chart to reward them for good behavior, or, if you’re a tech-savvy family there are several apps available that can make brushing more fun! You should brush your little one’s teeth for them until you feel confident in their ability to do so themselves. This usually happens around age six, often corresponding nicely with their heading off to school and tying their own shoes. Even after bigger kids start brushing on their own, it’s still important to supervise their brushing and flossing until they are about eight years old, when their six-year molars are safely sealed and healthy. By that time, there will be no doubt they are doing a great job! We hope you’ve followed our advice and implemented a healthy oral hygiene routine for your little one—but even the healthiest smiles still need routine cleanings and exams! Once plaque hardens into tartar, it can only be removed by a professional dental hygienist with the proper tools and techniques. Our hygiene team is friendly to put kids at ease in the chair and performs gentle yet thorough cleanings to take care of any plaque or tartar they’ve left behind—without any tears or sore gums! Regular check-ups are a great time for us to get a good look at how things are developing. We will check for signs of tooth decay and gingivitis (early-stage gum disease) so we can treat small issues before they progress. We also screen for oral cancer and take digital x-rays to make sure teeth are coming in properly. Oral health issues can be a big deal for kids, causing pain, developmental problems, missed school days, and overall health issues. Give your kiddo a healthy start by bringing them in to see us twice yearly for regular exams and cleanings. They may not thank you themselves, but their healthy smile definitely will! 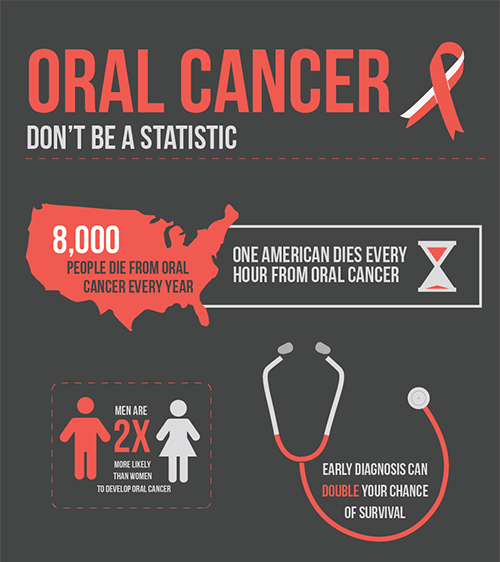 Oral cancer is one of the deadliest forms of cancer because it is typically not diagnosed until late stage. That’s why we are dedicated to providing regular oral cancer screenings for our patients. Yes, the risk for oral cancer increases with age and most oral cancer patients are older, but oral cancer does happen in kids as well and we are in a unique position (inside their mouth) to detect and diagnose oral cancer before it progresses. Certain factors increase their risk for oral cancer including a poor diet—processed foods and high sugar content—as well as excessive sun exposure and genetic predisposition. We can (we hope) rule out the major risk factors for oral cancer in adults including alcohol and tobacco use, although teens should be made highly aware of these risk factors and how these behaviors dramatically increase their risk for oral cancer. Regular screenings allow us to detect any changes or abnormalities that may be signs of oral cancer. Early detection and treatment is essential for survival and recovery, so pay close attention to your child’s mouth and be sure to bring them in regularly for cleanings, exams, and screenings. Fluoride is a naturally-occurring mineral that has been proven to dramatically reduce rates of tooth decay—especially in kids. That’s why Odenton’s (and most places in the US) water supply is supplemented with fluoride! But sometimes that’s not enough. Since kids lack the knowledge and dexterity to properly care for their teeth, baby teeth are much more prone to decay—despite our best efforts. That’s why fluoride is an essential component of any pediatric dental routine. After the age of three you can begin using a small amount of fluoride toothpaste to help keep cavities at bay. But if that doesn’t seem to be enough to keep the sugar bugs from munching on their enamel, we are happy to provide safe and effective (and delicious!) fluoride treatment for your family’s growing smiles. Maybe your little one is a sugar fiend and seems to have a new cavity (or several) every time you come see us. Maybe they have the healthiest diet and a strict oral hygiene routine—but they STILL have cavities! Whatever the reason, or if you just want to take the ultimate preventive measures, sealants are one of our best weapons against tooth decay and cavities. Sealants use a tooth-colored resin that’s painted over the surface of teeth to fend off plaque, bacteria, and acid that can wear down tooth enamel and cause cavities. Sealants have been shown to reduce tooth decay by up to 60%! When it comes to prevention, it doesn’t get much better than sealants to stop decay before it even starts. Are You Ready to Smile With Us? If you have any questions about preventive dentistry for kids or you’re ready to schedule a visit with your Odenton pediatric dentists, Drs. Kenny and Sarrah Zamora at Bayside Kids Dental, give us a call today or request an appointment easily online! Please call us at (443) 327-9108 or fill out the form below to request an appointment.